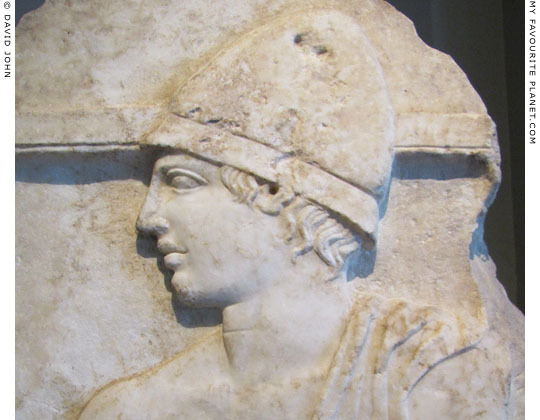 Detail of a Classical funerary relief of a soldier from Pella. Istanbul Archaeological Museum. Marble funerary stele from Pella, with a relief of a soldier wearing a conical pilos helmet. Classical period, 430-420 BC. Height 172.5 cm, width 61 cm, depth 9 cm. Inv. No. 85 T. Cat. Mendel 39. For further information about the pilos cap and helmet, see the Medusa page in the MFP People section. The stele in full length.